The program offers an opportunity to share the spiritual vision of the Benedictine Monks of Newark Abbey, to reflect more deeply about Gospel values and the Christian meaning of life, and at the same time incarnate those values in works of Christian justice and charity in the center of New Jersey's largest city. Teaching, tutoring, coaching sports and activities, doing clerical, computer, library and other work in St. Benedict's Prep School. The volunteer makes a commitment to the community for either of two periods: (a) Summer: during our prep school's summer session (six weeks from the end of June to the start of August), or (b) School year: from the beginning of September to beginning of June, or longer. Length and dates of service can be individually arranged, but are usually as follows. Long-term: For the school year (the beginning of September to beginning of June). Short-term: Six weeks from the end of June to the start of August, during our prep school's summer session. The program is open to Catholic men between the ages of 20 and 30, without dependents, who are serious about their personal search for God. A brief site visit is required as part of the application process. Room and board are provided free of charge. The volunteer receives a personal stipend of $100 per month. Health insurance is provided to volunteers for the duration of their stay. Full-time faculty members at St. Benedict's Prep have qualified for partial cancellation or deferment of certain types of student loans. Residence is in individual rooms in Turrell House, located alongside the abbey garden. Two or three members at a time. 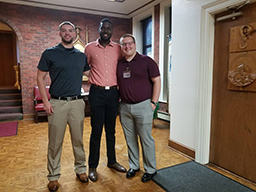 Orientation sessions introduce volunteers to the spirituality and the ideals of the monks of Newark Abbey. Regular presentations and reflections cover such topics as prayer, the Rule of Benedict, and monastic spirituality for lay persons. Individual spiritual direction is also available. Job orientation is provided as needed. Check out the Handbook/Qualifications for more specific information! Deadlines are flexible, but usually are as follows. for the Summer period: April 15; for the September to June period: June 15. The the Newark Benedictine Volunteers Program is a member of the Catholic Volunteer Network.